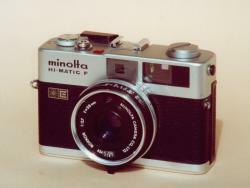 The Minolta hi-Matic F is a small compact of good quality. Made by Minolta in the seventies, this very light compact camera is fitted out with a 38 mm f/2.7 Rokkor lens. Exposure is fully automatic and gets down to 4 s.